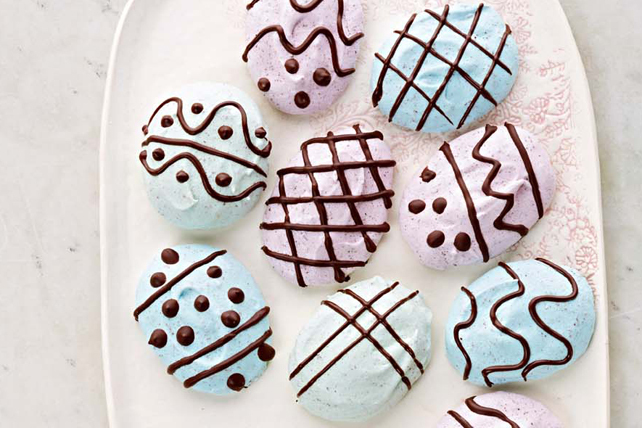 Our Chocolate-Speckled Meringue Eggs are a festive treat, beautifully tinted for the season. These melt-in-your-mouth sweet treats are sure to be a hit at your Easter gathering. Grate 1 oz. chocolate. Beat egg whites and cream of tartar in medium bowl with mixer on high speed until soft peaks form. Add sugar, 1 Tbsp. at a time, beating constantly until stiff peaks form. Gently stir in grated chocolate. Spoon egg white mixture into 3 bowls. Tint mixture in one bowl with 3 drops blue food colouring, then tint mixture in second bowl with 2 drops red food colouring and 1 drop blue food colouring. Tint remaining egg white mixture with 3 drops each yellow and blue food colourings. Drop egg white mixtures into 8 mounds per colour, 1 inch apart, on 3 parchment-covered baking sheets, using about 2 Tbsp. of each coloured egg white mixture for each mound. Gently spread each mound into 3x2-inch oval shape to resemble egg. Bake 50 min. Turn oven off. Let meringues stand in oven (with door closed) 10 min. Remove from oven; cool completely. Melt remaining chocolate as directed on package; cool slightly. Spoon chocolate into small resealable plastic bag; press bag to remove excess air. Cut small piece off one bottom corner of bag; use to pipe chocolate over meringues. Let stand until firm. For best results, prepare meringues on a cool, dry day. High humidity can result in chewy, sticky meringues. Store cooled meringues in tightly covered container at room temperature. Use a box grater to grate room-temperature Baker's Chocolate onto a sheet of parchment paper. Rearrange baking sheets in oven after 25 min. if your oven doesn't heat evenly.